Imagine walking into your favorite coffee shop. It still looks and smells the same, but something is off. As you approach the counter, ready to order the usual, it hits you – this place is being run by robots. These particular robots don’t care that you’ve been coming there every day for the past six months, or that you’re lactose intolerant. They’re not interested in talking with you about your morning or giving you a little something extra because you’re a loyal customer and you deserve it. Nope, these robots were programmed to do one thing and only thing only, and that’s get your money and give you a coffee back. That sounds horrible, right? And yet, that’s how some businesses still operate. We, the consumers, are mere representations of data and revenue – numbers. But we’re not numbers and they aren’t robots. So, what is the one thing that businesses and consumers ultimately have in common? We’re all 100%, completely, undeniably human. We live in a remarkable, revolutionary time where humans are more connected to technology than ever before. With technology comes the constant influx of information thrown at consumers from every which way on a daily basis. Out of necessity, we’re all learning to be selective. This has, in turn, forced businesses to reevaluate their approach to marketing. Because, let’s face it: it doesn’t matter how many marketing dollars you spend, if your brand isn’t resonating with your audience, it’s money wasted. With humans so attached to their technological counterparts, businesses must find ways to reconnect with consumers on each device and each social platform they use, but in a way that enables those consumers to actually feel connected to the business on a more human level than was previously ever required. As opposed to the Industrial Era where big businesses cast a shadow on their audience with power, authority, and demanded respect, the Human Era urges businesses to be a peer instead of a superior. Only by individualizing an audience and building authentic connections will a business thrive in the Human Era. After all, just because consumers are so connected to their devices doesn’t mean they’ve stopped craving human experiences and interactions. Those brands who fit the Human Era brand mold are creatively paving the way for a new world of marketing that sparks an emotional connection with the audience. Taking it behind the scenes in the video below, Kevin Krone, VP and Chief Marketing Officer, explains what Southwest’s “heart” is and why they’ve incorporated their heart symbol in the design of their planes and in everything they do as a brand. By now, I’m sure you know what was missing in that coffee shop from before: an emotional connection. There was no heart in that business or the experience you were presented with (or lack thereof). There was no trace of an emotional connection. You didn’t smile or laugh; you were met with a faceless, emotionless machine. That is the exact feeling that human-to-human marketing aims to eliminate. What are some vital qualities of a humanized brand? Integrating super personalized marketing into your strategy is a way for your business to say, “I’m listening. I know what you want, I know what you need, and I know what you enjoy.” The more your business shows this to a customer or prospect, the more likely they will be to connect with you and become a promoter of your business. 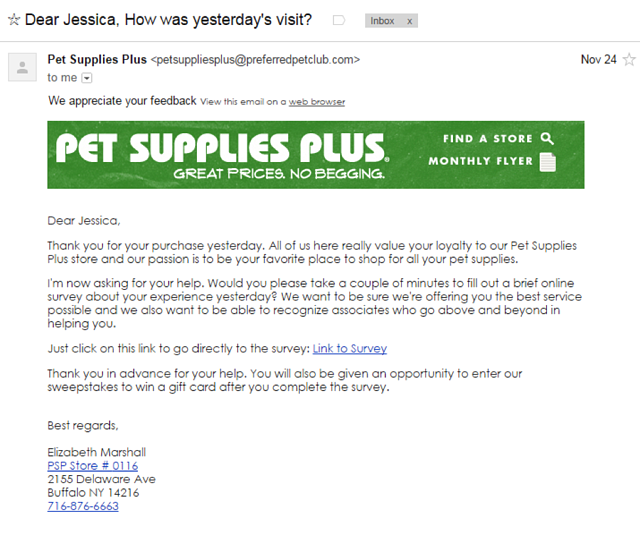 I was personally tickled to receive this email from Pet Supplies Plus after a visit into their local location in Buffalo, NY last month. They asked me to take a survey, which also means they really care about my experiences in-store. Way to go, Pet Supplies Plus! Personalized marketing takes a tremendous amount of planning, strategizing, and following through, but there are amazing marketing automation tools out there developed to help marketers get personal with ease! Oh, the times we live in. Hill Holliday’s campaign for LG, “Mom Confessions,” shows the inner thoughts of a humorously cynical mom. Acknowledging that moms often have that inner dialogue when doing the often daunting tasks that are essentially the glue holding a household together is something I’m sure most moms can appreciate. However, you don’t have to be humorous to show customer empathy. Understand your audience well and understand the problems they face. Then integrate that understanding into your advertising, social media posts, blogs, etc. Just show them you care, and that no one in this world goes through anything alone. Humans want to feel inspired to be themselves, to make their lives better, to strive for success. The brands that forego bragging about how their products and services will change your life for campaigns that just move you to feel inspired are the brands that truly shine to their audience. Not surprisingly, Dove is one of those brands. The ongoing Dove Campaign for Real Beauty launched by Uniliver has a mission to “create a world where beauty is a source of confidence and not anxiety." With the same goals, Under Armour’s “I Will What I Want” campaign featured ballerina Misty Copeland, who didn’t “fit the mold” as a ballerina. This was explicitly expressed in a “Thanks, but no thanks” letter denying her application to a ballet academy, but that didn’t stop her from demanding respect in her sport as a ballerina. The advertisement (below) is goose-bump inducing, to say the least. That man was Dharmesh Shah, co-founder of HubSpot. He’s had massive success creating an educational and efficient marketing automation software company to help further the inbound marketing methodology, so it would be wise to take his advice. Problems come in many forms and sizes, but perhaps your most important job is to fix them. Help consumers use your products, help by answering a question or alleviating an issue they’ve expressed they’re having - regardless of the time of day or night. This post gives you eight incredibly helpful ways to ways to solve your prospects problems through your marketing, and is definitely worth a read if you’d like some specifics. Humor is one emotion that has the power to really win over your audience. Humor is a completely human attribute and it elicits joy and happiness, and is honestly quite addictive. Integrate it into your marketing effectively and your audience will be coming back for more, guaranteed. BuzzFeed, is one of my favorite online media destinations. Why? They just get it! They understand the way we consume information, and they especially get it when it comes to humor. They know how their audience operates, they know their personas well and they know what they think is important or funny. With that knowledge, they create amazing media and blast it to any social channel where their audience can be found. As mentioned in Bryan Kramer’s book Human to Human: #H2H, humans make mistakes, so don’t be afraid if your business does. DiGiorno Pizza made a big mistake with their real-time marketing by hopping on the trending #WhyIStayed hashtag with what was declared the absolute worst brand tweet of 2014. 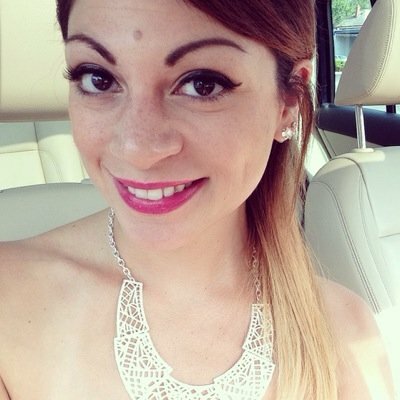 Not realizing that after the controversial domestic violence incident with then-Baltimore Raven’s player, Ray Rice, the hashtag was trending because women were voicing their stories about why they stayed, or didn’t stay, in an abusive relationship. 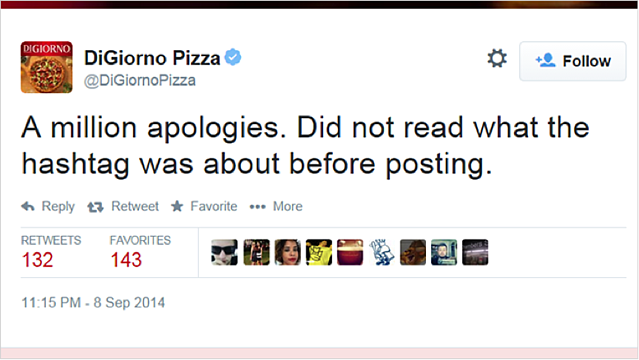 DiGiorno quickly removed the tweet, but didn’t cower in fear of the repercussions of it. They personalized a tweet to many of the obviously offended Twitter users expressing how truly sorry they were and that there was no excuse for the mistake. Human brands make mistakes, and human brands say they’re sorry. No human or brand is perfect, but showing remorse for any offensive mistake can certainly garner respect and nurse some wounds. 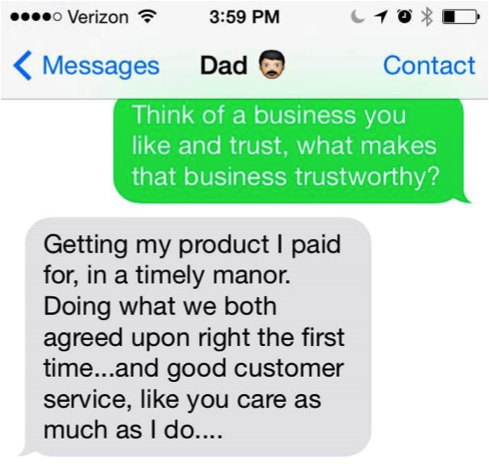 I asked my Dad to think of a business he liked and trusted, and to tell me what that business did to earn his trust. This is a man that couldn’t really care less about social media or fancy marketing ploys. He hears out a brand’s promise and expects them to follow through. He wants a brand to care about his investment in their business as much as he does, and he wants to be treated like a human, by humans. 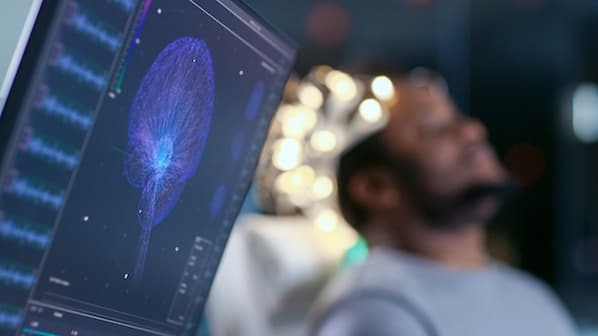 Humans aren’t easily fooled anymore, and if you’re hiding something from your consumers or stretching the truth of your story, they’ll quickly communicate their findings through their connected self and you’ll be exposed to the audience of their own personal brand. Be authentic to your message. If what you’re telling is true, you won’t have to hide behind the walls of your social media channels. Moreover, transparency is one of the largest trustworthy attributes of any business; in a world where corporate trust has been depleting, transparency and authenticity will give you a trusting edge against your less open and honest competition. Perhaps one of the most prominent buzzwords of recent years, storytelling is still a fundamental piece of the human experience puzzle. 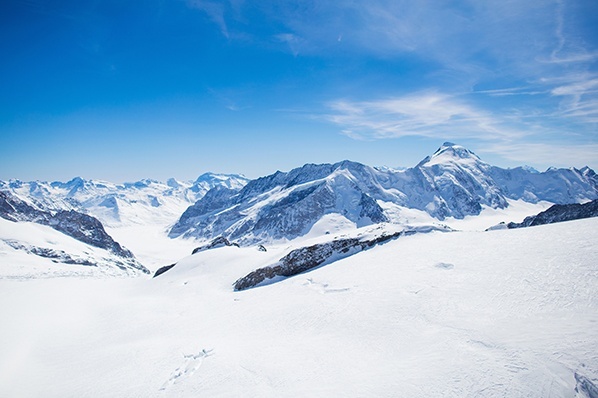 Humans have preconceived ideas about their world – stories we tell ourselves. Brands and businesses have to find a way to fit into those stories or add to them. That’s why the development of buyer personas is so crucial. If you don’t know the beliefs, wants, and needs of your audience, how can you know that the content you’re presenting them is relevant at all? Humans want to experience a business and building a story around your products and services will help them experience you. I absolutely love Seth Godin’s novel first published in 2005 as All Marketers Are Liars with a revised cover in 2009, All Marketers Are Liars Tell Stories. Seth explains that conversations are had and stories are told about your business with or without you. So why not create a great story and experience and let that be what spreads? The best way to ensure that your good story remains true is to introduce a company culture that reflects it. Humanizing your brand starts from the inside and works its way out. Live your story, and you’ll radiate it. In 2013, Trader Joe’s was America’s favorite grocery store according to a Market Force study. Many special and unique characteristics of the beloved grocery store attract customers and keep them coming back for more, including personalized in-store signage made by employees, new and exotic items you can’t find anywhere else, super punny product names, and more. The first step towards becoming a more human business is to understand the humans of your target audience. Download our guide to creating buyer personas to start understanding and targeting your audience more effectively.